...well, we used to. THEY have eaten almost all of the leaves of my mom's Periwinkles. There were about 8 of THEM - none of them shorter than my longest finger - THEY were fat with chlorophyll, had purple and teal eyes with a sinister glare, tiny white dots form a row on either side, and they had these clawlike appendages near their heads. 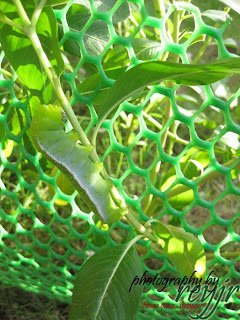 Caterpillars have invaded our garden! This one on the left was making it's way back to the top where there were more leaves to consume. 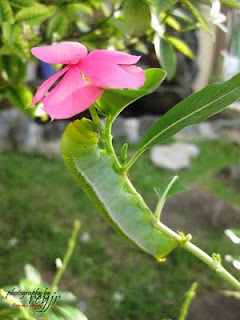 What a tremendous appetite - "patay gutom" of the invertebrates. =p The one on the right flashed me its tush while I snapped a photo-ala-paparazzi. 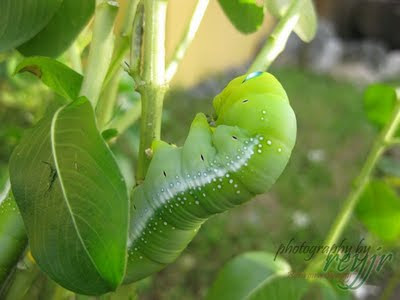 Good thing we went to a Butterfly Park on our trip to Bohol - there we learned that caterpillars like these do not sting when you touch them. 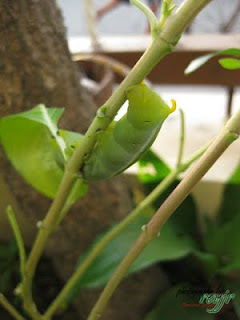 My gf even touched one of the caterpillars - she said it was soft to the touch and very smooth. 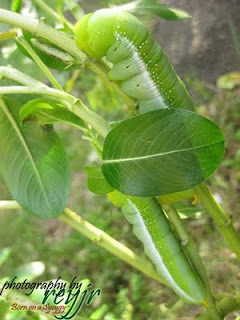 Are you scared of Caterpillars? Have you ever touched one? What was it like?